Love is in the air...well, along the river! The Murray River region is close to capital cities but offers something difference in the romance department...a tranquil river and magical, ancient location. Unique luxury accommodation options, some of the best food and wine experiences set amongts great landscapes ensures you and your love will find time, space and the perfect environment to reconnect. The slow nature of the river means you can unwind, chill and take life at your pace. By the river it just pulls your soul into its calming water while you pamper and indulge to your hearts delights. For the adventures couples we have lots and lots of national and conservation parks to explore by walking or driving trails. Great shopping with some amazing antique stores to mill around. You can take a canoe/kayak ride in the backwaters of the lagoons or along the river, relax on a houseboat, drop a line in or snag some yabbies, check out some of the historic pubs along the river, jump on a bike and cruise along the riverside or you can pamper yourself in the day spas found in many towns. One of our favourites is to discover the local food and wine, some of the best in Australia, find a spot by the river amongst the quiet of the 500 year old gums and birdlife and just be with each other. 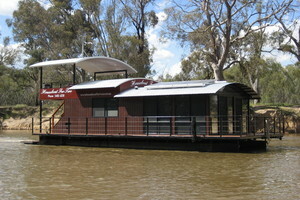 Visit the towns page on the Murray River website, grab a copy of the Discover Murray River Trail by contact the local visitor centres and start planning your romantic getaway in the unique landscape of the Murray River.